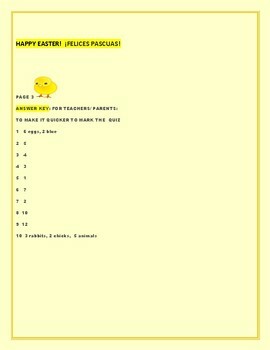 This is a fun holiday simple addition quiz with all sorts of festive pictures. Children write in their responses. 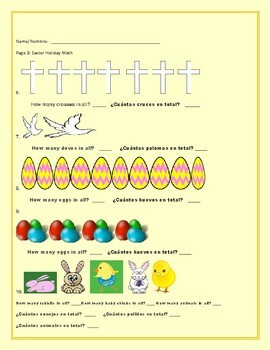 (K-2) There is a hint of science mixed in this Easter quiz, as well as a wee bit of perception. 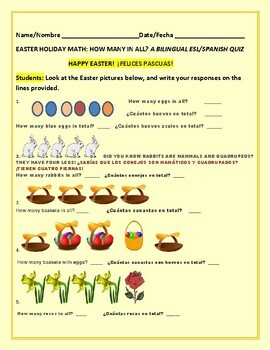 It is bilingual, and good for English speaking children, as well as ESL/Spanish speakers. Thanks ever so much for visiting. Happy Easter, to everyone! ¡FELICES PASCUAS! GRACIAS!